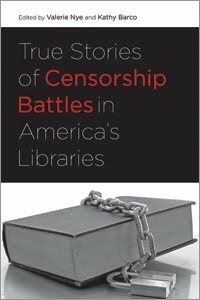 We are very pleased to announce True Stories of Censorship Battles in America's Libraries is available through the American Library Association's website. You can order a copy for you and your library by following this link. Intellectual freedom is a core value of librarianship, but fighting to keep controversial materials on the shelves can sometimes feel like a lonely battle. Not all censorship controversies involve the public objecting to a book in the collection—libraries are venues for displays and meetings, and sometimes library staff themselves are tempted to preemptively censor a work. Those facing censorship challenges can find support and inspiration in this book, which compiles dozens of stories from library front lines. The book's editors are available to speak at conferences, staff trainings, and community forums. For more information on available dates and author fees, send an email to: valnye@gmail.com and/or kathy.barco@gmail.com.